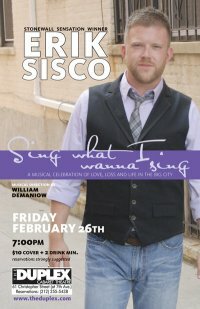 Erik Sisco is a versatile singer/actor with stage and cabaret credits throughout the city and across the country. Originally from Flint, Michigan, Erik is the winner of Stonewall Sensation, a vocal competition at the historic Stonewall Inn in Greenwich Village, where he recently premiered his new show, “Sing What I Wanna Sing.” A growing presence in the New York cabaret/nightlife scene, Erik has been invited to perform in some of the city’s best venues and showcases, including “Monday Nights, New Voices” at The Duplex, “Brandon Cutrell and Cohorts” at the Laurie Beechman, “Scott Nevins’ Curtain Call” at Splash and “Broadway Sessions” at Therapy, as well as appearances at the New York Gay Life Expo, Birdland, The Reprise Room, and The D-Lounge, to name a few. Erik frequently participates in workshops, readings, concerts and recordings of new works, and he can be heard on the acclaimed album, keys, the music of Scott Alan. Erik’s recent stage credits include the Host in the new musical dating game show, “Nab-a-Date”, the first national tour of Theatreworks/USA’s new musical version of the beloved “Anne of Green Gables,” and the New York and Los Angeles premieres of “R.R.R.E.D.” with singer/songwriter Katie Thompson. Erik holds a BFA in Music Theatre Performance from Western Michigan University. Be sure to catch Erik this Wednesday, August 26 LIVE at 9:30pm at the Duplex in NYC. 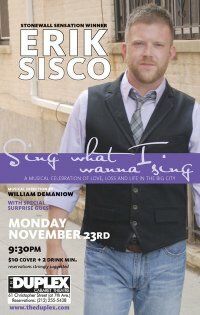 For everything Erik, visit: http://www.broadwaydemo.com/eriksisco. 1. Who inspired you to become a performer? The first singer to inspire me was Whitney Houston. Her first album was the very first cassette tape I ever owned and I played it until it wore out! I think she was probably the most dynamic singer modern music has ever known, and I’ve always thought of her as my first voice teacher. I always tried to emulate her sound when I was singing. 2. When did you realize you wanted to become a performer? I think I always knew, in a way. I was the kid who ran around using anything I could as a microphone…hair brushes, curling irons, spoons. It was always my passion. I didn’t decide to pursue performance as a career until the end of high school, however. I was valedictorian of my graduating class and was contemplating taking the path of medical or law school…I thought I might pursue education for a moment. Then I auditioned for a music theatre performance program (sort of on a whim) and got in. That was when I realized that I could actually make a life out of being a performer…much to the chagrin of my mother! 3. What is the highest and lowest note you can sing? Well, it depends on the day really, but my low register reaches down to about a low E (I sing bass in a choir) and at the top, full voice, around A. I guess I’m what you would call a baritenor. I have some more tenor notes on good days, but on a consistent basis, A is about my limit. 4. What is the best advice a teacher ever gave you? The best advice I was given was actually not advice so much…I had gained quite a bit of weight in school and I had a teacher who told me that I probably was not going to make it professionally and should think about taking another path. That was one of the biggest motivators of my life…it made me get my act together and work even harder to prove that I could do it, no matter what size I was. 5. Do you have any strange or unusual talent that no one knows about? Nothing really that out of the ordinary…I’m a pretty good whistler. And I do a lot of silly voices that no one except my partner and close friends hear. 6. If you could dream about anyone while you sleep, who would it be? This may be the gayest thing I’ve ever said, but it would be Judy Garland. 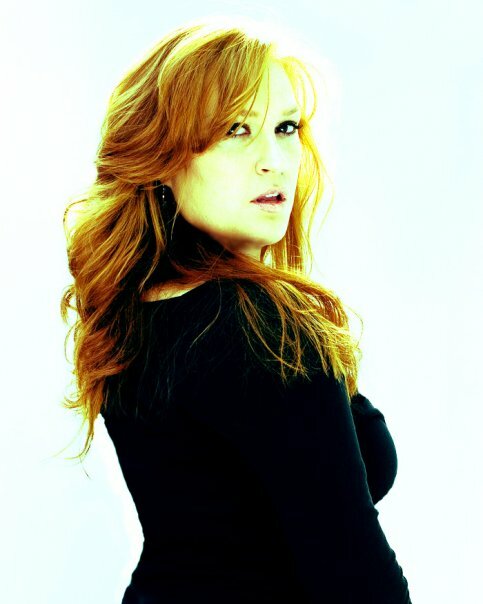 She has been one of the biggest artistic influences in my life, and I’ve always wondered what it would have been like to hear her live…to be in the same room with her while she was pouring her soul out onstage. I suppose dreaming it is the closest I’ll ever get! 7. Starbucks or Dunkin’ Donuts? What do you order? I prefer Starbucks coffee (iced venti coffee with half and half and 2 splenda) but I can’t resist a Dunkin Doughnuts Sausage Supreme Omelet on a whole wheat bagel. 8. Boxers or Briefs? Boxer briefs! 9. Favorite website? I’m slightly ashamed to admit it, but I spend a ridiculous amount of time on Facebook. 10. Superman or Wonder Woman? Oh my God! Wonder Woman, for sure! She was my hero when I was a little kid. I’ve heard some great stories from my family about me running around in my Wonder Woman underoos and cowboy boots, with a golden lasso and wrist deflectors…I’m told I would run into a room and yell, “WONDER WOMAN!” Nope, wait, now THAT’s the gayest thing I’ve ever said.